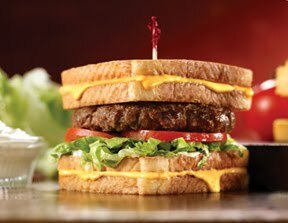 This is The Grilled Cheese BurgerMelt from the restaurant. There are two grilled cheese sandwiches for buns. No bacon? Disgusting, take it away. The Grilled Cheese BurgerMelt appears to be inspired by similar "Fatty Melts" and "Chubby Melts" that have been served in the South for a few years now, as well as the Midwest. 79g Total Fat - Most vegetables have more than that. 2090mg Sodium - You get that much salt just breathing. 54g Protein - Protein is good for you.